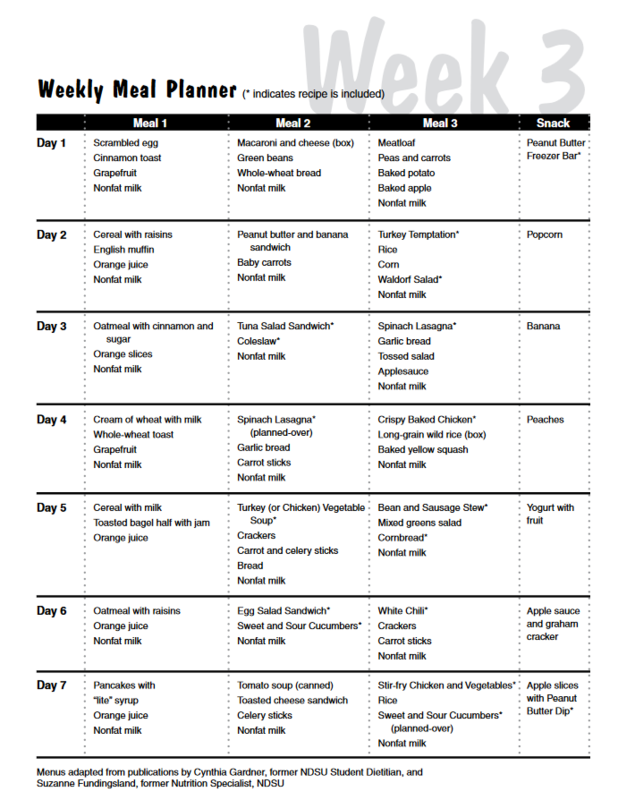 You may have established a weekly menu and shopping list, but now you need the food. Going to the grocery store to buy food for your family may be something you do not look forward to doing. Decreasing the amount of time and money you spend there may help change that. This is the third in a series of publications to help you eat well but spend less at the grocery store. Shop$mart! Which of these cost-saving ideas do you use? I shop alone* and/or go only once a week. I have a snack before going grocery shopping to prevent impulse buys. I avoid buying nonfood items at the grocery store. Unless they’re on sale, the prices of soaps, shampoos and paper products can be inflated. I stay alert for checkout counter mistakes. Look carefully at your receipt to make sure you get the sale price on sale items. Check your change, too! *If you are not able to shop alone, have your family members help you. 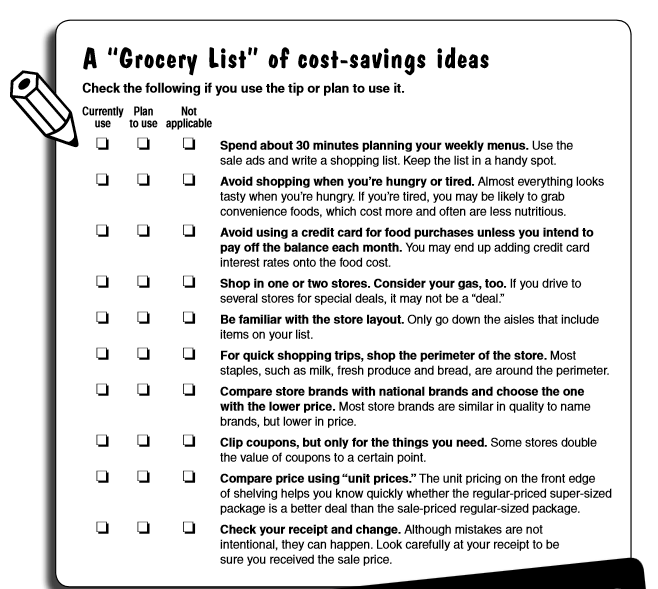 Assign them different tasks, such as price checking or getting hard-to-reach items on the bottom shelves. This may distract them from checking out the tempting candy, cookie and toy aisles, and they can learn to become smart shoppers, too. Fruits and vegetables add color to your plate and nutrition to your menus. Unfortunately, many children and adults fall short of the amount recommended for them. Fruits and vegetables provide a wide range of essential vitamins, minerals and fiber. They are naturally low in calories. Eating more fruits and vegetables can help with weight management and can help reduce your risk of cancer and heart disease. • Compare prices. Consider all the forms of fruits and vegetables that are available: canned, fresh, frozen and dried. Buy the forms that best fit your storage options, lifestyle and budget. • Buy fresh fruits and vegetables in season when they are at their highest quality and best price. • Choose fruits without added sugar or syrup and vegetables without added salt, butter or cream sauces. 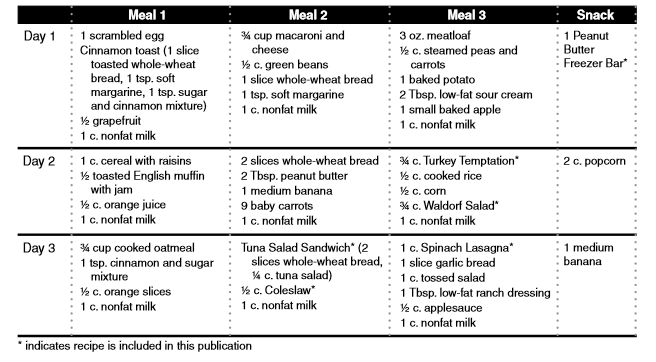 Compare Nutrition Facts labels for sodium and fat content. • Use fresh produce first so it does not spoil. Then use canned or frozen fruits and vegetables until the next shopping trip. You can find the latest nutrition recommendations. Each person has different needs based on gender, age and level of physical activity. Learn what each of your family members needs at his or her particular calorie levels by visiting the website or contacting your local Extension agent for “MyPlate Plans” handouts for different age groups. The MyPlate Plans are available online. To prevent wasting food, protect the food you buy. 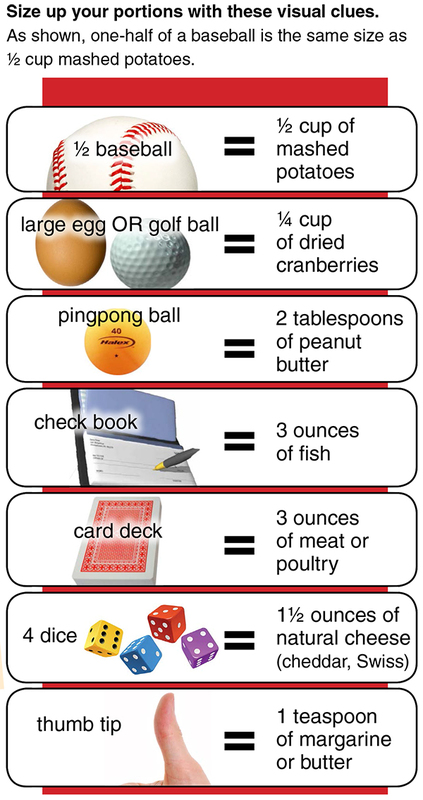 Use care, cleanliness and common sense when storing food. • Put food items that spoil easily in the refrigerator or freezer as soon as you return from the store. Check to make sure your refrigerator keeps food below 40 F.
• Label food products with the date of purchase and arrange them in a “first in, first out” manner. • Do not store food in a cabinet near chemicals (such as detergents or bleach) or directly below the kitchen sink or any cabinets that gets too wet or too warm. Slice sausage into ¼-inch-thick rounds and fry until brown. Add onion to sausage and brown. Drain fat. In a large pan, combine sausage and onions with rest of ingredients. Cover and simmer 45 to 60 minutes. Serves six to eight. Per serving: 190 calories, 6 g fat, 11 g protein, 26 g carbohydrate, 6 g fiber and 720 mg sodium. Mix milk and peanut butter together in a mixing bowl. Add pudding to peanut butter/milk mixture. Stir mixture until smooth. Spread a thick layer of pudding on a graham cracker. Top with another graham cracker. Put crackers into a covered dish. Place dish in freezer. Serves six. Per serving: 340 calories, 14 g fat, 9 g protein, 4 g carbohydrate, 1 g fiber and 320 mg sodium. Heat oil in a large frying pan. Stir-fry chicken quickly until lightly brown. Add vegetables, broth and soy sauce. Bring to a boil. Cover and cook for five minutes over low heat or until vegetables are crisp-tender. Blend cornstarch and ¼ cup cold water. Add to chicken mixture. Cook until the mixture thickens and bubbles. Stir the mixture constantly while it is cooking. Serve over hot cooked rice. Serves four. Per serving: 180 calories, 9 g fat, 13 g protein, 11 g carbohydrate, 2 g fiber and 1160 mg sodium. Preheat oven to 350 degrees. Mix together turkey, bread crumbs and egg in a bowl. Shape mixture into meatballs. Make about 30 balls. Heat oil in a frying pan. Lightly brown meatballs in the heated oil. Put the meatballs in a baking dish. Drain leftover fat from the frying pan. Add soup and milk to frying pan. Heat and stir until smooth. Pour sauce over turkey meatballs in baking dish. Cover and bake at 350 degrees for 35 minutes, or cook over low heat on stovetop. Serves six. Per serving: 180 calories, 9 g fat, 18 g protein, 8 g carbohydrate, 0 g fiber and 280 mg sodium. Note: If dish is microwave safe, microwave covered dish for 10 to 12 minutes at 50 percent power, turning one or two times. Let stand five minutes before serving. Combine 3 cups of broth, onion, chilies, beans and cumin. Simmer for an hour. Add 1 to 1 ½ cups cheese and chicken. Cook until chili is thick and add additional broth as needed. Top with shredded cheese, nacho chips, sour cream and salsa if desired. Serves 12. Per serving: 220 calories, 6 g fat, 25 g protein, 14 g carbohydrate, 5 g fiber and 410 mg sodium. Set oven at 350 degrees. Brown beef in a frying pan. Drain fat. Add garlic powder to browned beef and mix well. Add tomato sauce, tomatoes and pepper to frying pan. Cover and cook on low heat for 15 to 20 minutes. Mixture should boil gently. Layer half of the uncooked noodles, mozzarella, cottage cheese, tomato/meat sauce, spinach and grated parmesan cheese in baking dish. Repeat with other half. Start with a layer of noodles. Cover top of lasagna with a layer of sauce. Sprinkle with parmesan cheese. Measure 2 cups water and add to lasagna. Cover tightly with foil. Bake at 350 degrees for one hour and 15 minutes. Serves eight. * Per serving: 370 calories, 13 g fat, 29 g protein, 31 g carbohydrate, 2 g fiber and 820 mg sodium. *Quick Tip: You can freeze the leftovers in single-serving containers for a quick lunch. Mix all ingredients in a large pan. Cover, bring to a boil and cook until potatoes are done (15 to 20 minutes). Serve with crackers. *You can substitute leftover vegetables of choice. Serves six. Per serving: 190 calories, 2.5 g fat, 17 g protein, 21 g carbohydrate, 2 g fiber and 960 mg sodium. Mix ingredients together in a small bowl. Use as a dip for fruit. Serves four. Per serving: 80 calories, 4.5 g fat, 3 g protein, 7 g carbohydrate, 1 g fiber and 55 mg sodium. 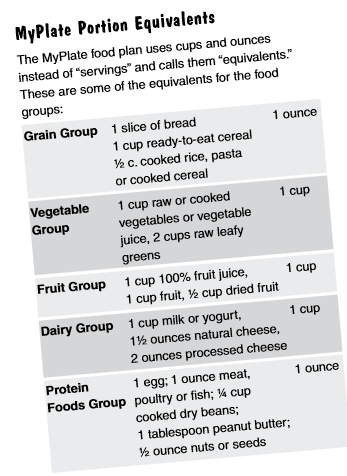 Quick Tip: Make half your grains choices whole grains. Enjoy sandwiches made with whole-grain bread, such as whole wheat, more often. Open tuna can and drain tuna. Put tuna in small bowl. Wash and chop celery on cutting board. Measure ¼ cup mayonnaise. Add celery and mayonnaise to tuna in bowl. Mix well. Place four slices of bread on cutting board. Put one-fourth of tuna mix on each slice. Spread tuna over bread and put another slice of bread on top. Cut sandwiches in half and serve. Serves four. Per serving: 190 calories, 2 g fat, 16 g protein, 30 mg carbohydrate, 0 g fiber and 450 mg sodium. *To cut calories and fat, use nonfat or low-fat mayonnaise, or use half nonfat yogurt. Wash cucumbers. Score cucumbers with the tines of a fork. Thinly slice. Put sliced cucumbers into a bowl and add salt. Let stand in fridge for 20 minutes. Drain off water. Add vinegar and sugar to cucumbers. Chill before serving. Serves four. Per serving: 30 calories, 0 g fat, 1 g protein, 7 g carbohydrate, 1 g fiber and 580 mg sodium. Mix celery, apples and walnuts in a mixing bowl. In the other mixing bowl, mix yogurt, lemon juice and sugar. Add to the celery and apple mixture and mix well. Chill before serving. Serves six. Per serving: 110 calories, 7 g fat, 3 g protein, 12 g carbohydrate, 2 g fiber and 30 mg sodium. Put eggs in pan. Cover with cold water. Put pan on the stove and heat until the water starts to boil. Take pan of eggs off the stove, cover the pan and let it stand for 15 minutes. Wash and chop the celery and put in small bowl. When eggs have stood for 15 minutes, pour cold water over them. Take out of water and peel the eggs. Cut eggs on cutting board and put in bowl. Measure and add mayonnaise and mix well. Place four slices of bread on cutting board. Put one-fourth of egg mix on each slice. Spread egg mix over bread and put another slice on top. Cut sandwiches in half and serve. Serves four. Per serving: 220 calories, 7 g fat, 12 g protein, 30 g carbohydrate, 0 g fiber and 390 mg sodium. Set oven at 400 degrees. Measure cornflakes into a plastic bag. Close. Crush cornflakes with rolling pin or glass. Rinse the chicken pieces and pat dry. Pour the skim milk into a bowl. Dip each piece of chicken in milk and then shake in bag of cornflake crumbs. Let stand briefly until coating sticks. Oil pan. Place coated chicken pieces in oiled pan. Pieces should not touch each other. Bake at 400 degrees for 45 minutes. Serves four. Per serving: 340 calories, 8 g fat, 53 g protein, 10 g carbohydrate, 0 g fiber and 200 mg sodium. Chop cabbage and grate carrot. In bowl, mix other ingredients. Add cabbage and carrot and mix well. Chill until ready to serve. Serves eight. Per serving: 120 calories, 10 g fat, 1 g protein, 5 g carbohydrate, 1 g fiber and 100 mg sodium. Butter baking pan and set aside. Set oven at 425 degrees. Mix dry ingredients together in a bowl. Add the rest of the ingredients and mix well. Pour cornbread batter into baking pan. Bake at 425 degrees for 20 minutes until golden brown. Serve hot. Serves six. Per serving: 280 calories, 11 g fat, 7 g protein, 39 g carbohydrate, 1 g fiber and 530 mg sodium. This material was funded by the U.S. Department of Agriculture’s Supplemental Food Assistance Program (SNAP). SNAP provides nutrition assistance to people with a low income. It can help you buy nutritious foods for a better diet. To find out more, contact your county social services office.